Born Nelly Adèle Anny Martin. She studied singing at the Conservatoire National de Paris under Martini and Isnardon. In 1906 she won a price and made her debut in 1907 at the Grand Opéra in Paris as Naiade in ‘’Armide’’ of Gluck. Then she sang there the part of Rafaële in ‘’Patrie’’ by Paladilhe and also appeared in the premiere of the opera ‘’La Catalane’’ of Le Borne (24. 5. 1907). 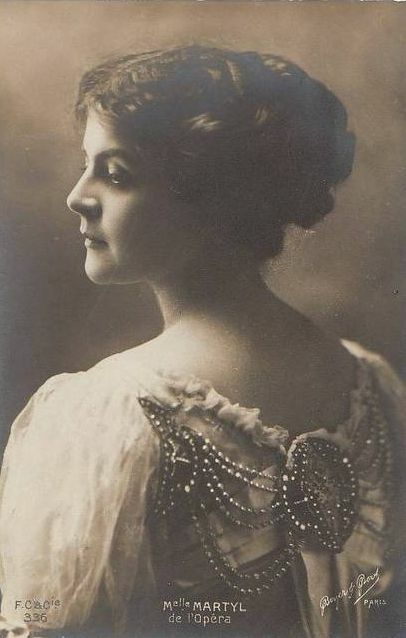 In 1909 she joined to the Opéra-Comique in Paris. Here she sang many parts and performed also in several premieres. In 1912 she participated there in the premiere of the opera ‘’La Sorcière’’ by Camille Erlanger (as Juana). Her repertoire included Rosenn in ‘’Le Roi d'Ys’’ of E. Lalo, Micaela in ‘’Carmen’’, Sophie in ‘’Werther’’ of J. Massenet, Fatima in ‘’Le Caïd’’ of A. Thomas, Laurette in ‘’Richard Coeur-de-Lion’’ of Grétry, Cupid in ‘’Orpheus’’ of Gluck and Mimi in ‘’La Bohème’’. Beyond the French metropolis she appeared also in French provincial theaters and made guest appearances at the Opéra Monte-Carlo (among other things in 1922 in the premiere of the opera ‘’Amadis’’ of J. Massenet) and undertook a tour through Romania. Married the known painter Georges Scott Plagnolles (1873-1942).